Hello Vendors, Participants, and Marketeers! Today, WED AUG 06, marks the 10th week of the season for the “Heart of the Garden” Farmers’ Market, co-sponsored by the Township of Pemberton and the DEBORAH Heart and Lung Center. Please remember, the Market is closed WED AUG 13 when the field is used to host the St Ann’s Carnival. 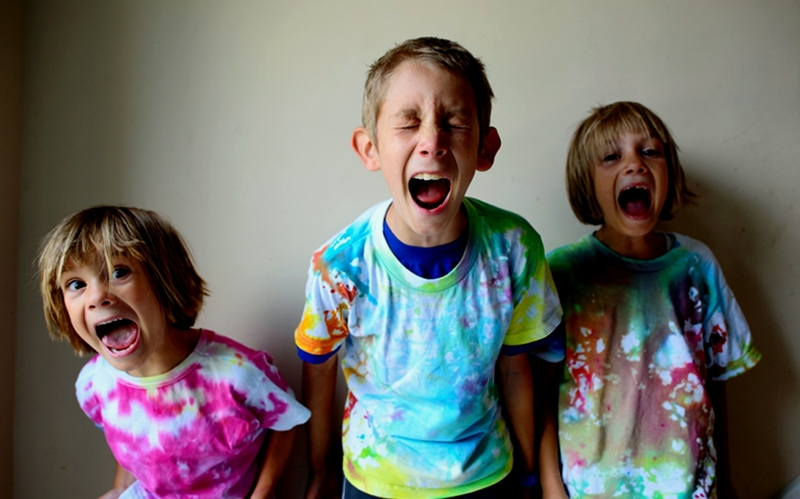 It’s also the fourth week of our special series of Family Friendly events. We have three activities planned for our young guests today. 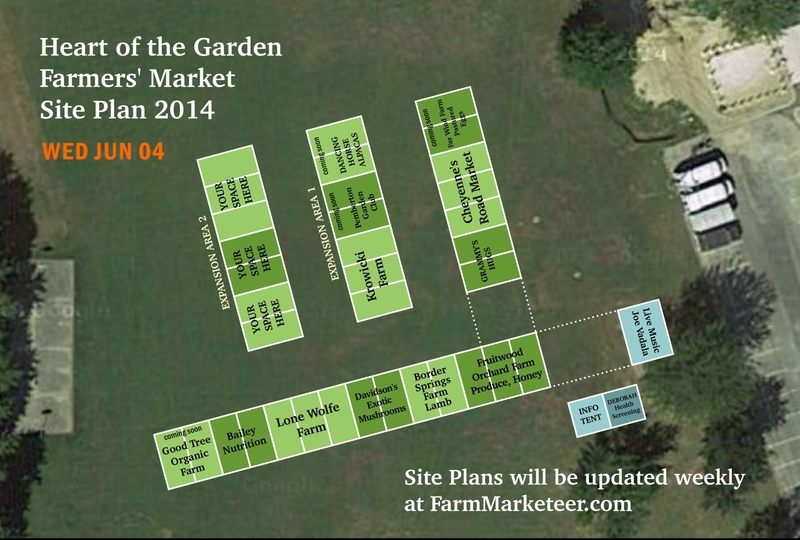 Please pay attention to the new site plan below. Instead of spreading out, let’s “circle the wagons” and create a smaller, more intimate, livelier atmosphere centered on the music stage. We’re adding some picnic tents at the “front,” and putting vendors on both sides of the lane, facing each other. I’ll need your attention and cooperation when you arrive to make the new plan work. Small, single-product vendors are having a hard time doing enough sales to justify the expense of coming to the Market while we build a steady customer base. To make sure we have enough variety to keep people coming back, the Market is selling Davidson’s Exotic Mushrooms, Wild Flour Bakery breads, and Mr. McGregor’s fruit pies from the Market Table. This post is not for the general public. It’s for the benefit of Market participants. We have a facebook page and are building an email list to communicate with Marketgoers. You’ll get your news here; you’ll receive weekly email with a link to a new post at this blog for announcements and the site plan for the week. 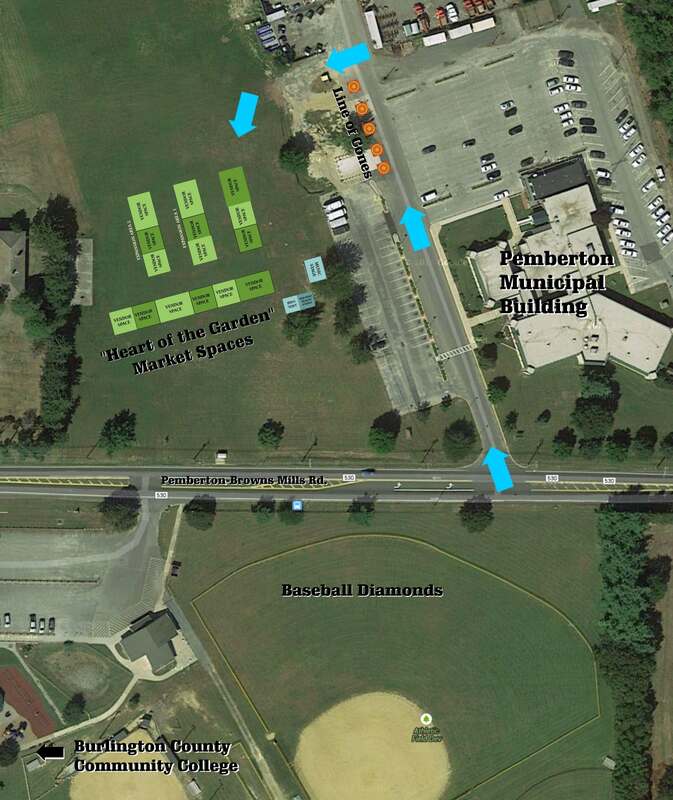 The address is 500 Pemberton-Browns Mills Road, in the open field alongside the Pemberton Municipal Building. An aerial photo below shows the site location across the street from the athletic fields with their baseball diamonds, just down the road from the Burlington County Community College campus (and very near the tall blue water tower). A link to Google Maps for driving directions is also provided below. Arrive no later than 1:00pm, please. Be set up and ready to sell when the Market opens at 2:00pm. Stay until the Market closes at 6:00pm. An aerial map with arrows showing the entry plan is shown below. To exit, follow the arrows backwards. Drive in off Pemberton-Browns Mills Road, proceed past parking and beyond the line of cones. Turn left just before the green-and-white snow fence into the field. Drive directly into the Market, following the site plan, looking for white stripes drawn on the grass. Park your vehicle across the back of your area inside your assigned spaces. Set up tents and tables across the front of your assigned space. 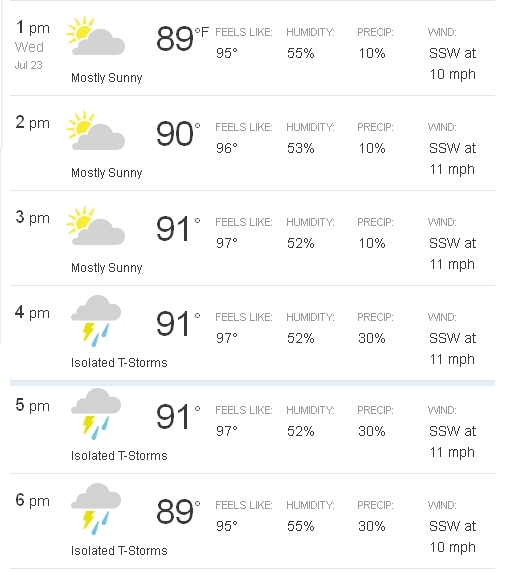 Bring and use tent weights or stakes for everybody’s safety. The Market site is a grassy field. 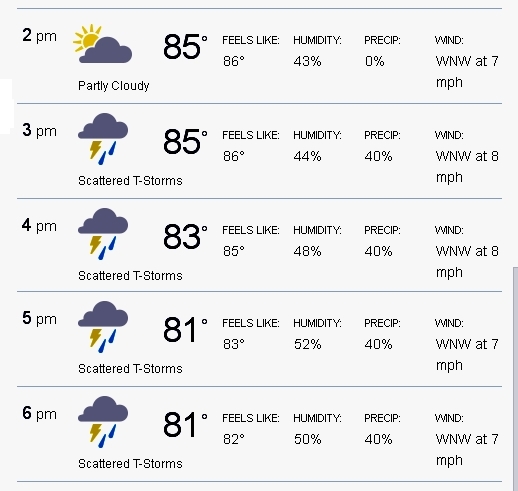 It should be dry tomorrow, but consider bringing a mat just in case. There has not been much activity on this page in recent weeks. 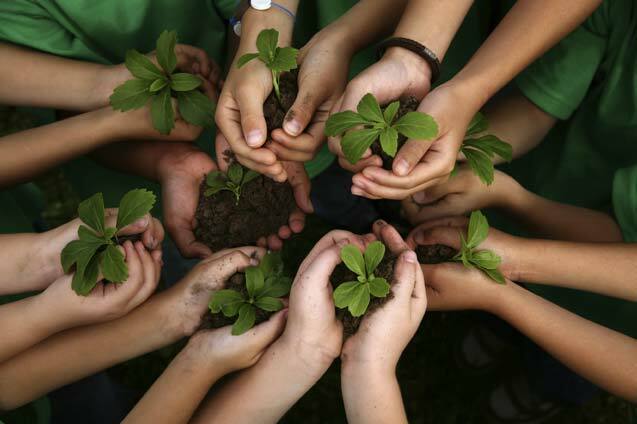 Please feel free to post news about your farm or business to generate interest in the site. You can “Check In” on facebook when you arrive to let your friends (and your boss) know you’re here. 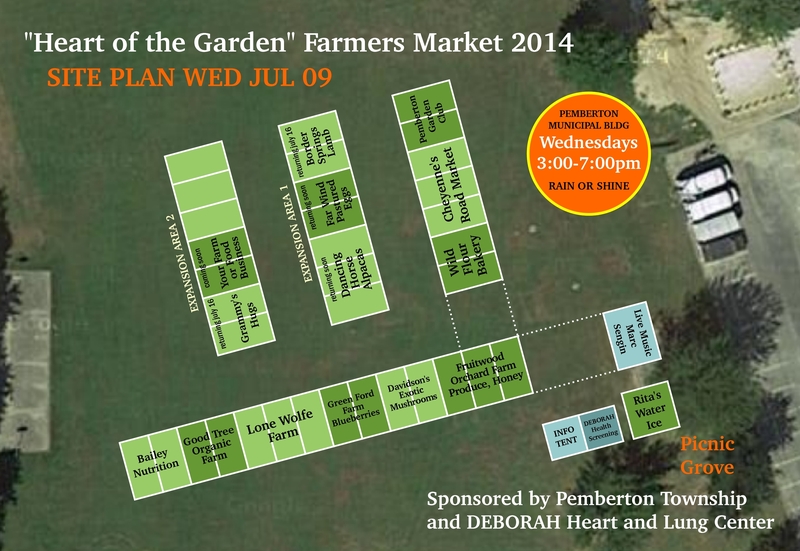 Today, WED JUL 30, marks the 9th week of the season for the “Heart of the Garden” Farmers’ Market, co-sponsored by the Township of Pemberton and the DEBORAH Heart and Lung Center. Today, WED JUL 23, marks the 8th week of the season for the “Heart of the Garden” Farmers’ Market, co-sponsored by the Township of Pemberton and the DEBORAH Heart and Lung Center. Please pay attention to the new site plan below. The township has striped new lines to help us achieve a “square horseshoe” layout suggested by Christina Krowicki. The plan achieves a good street appeal without consigning any unfortunate vendors to “the backyard.” I’ll need your attention and cooperation when you arrive to make the new plan work. 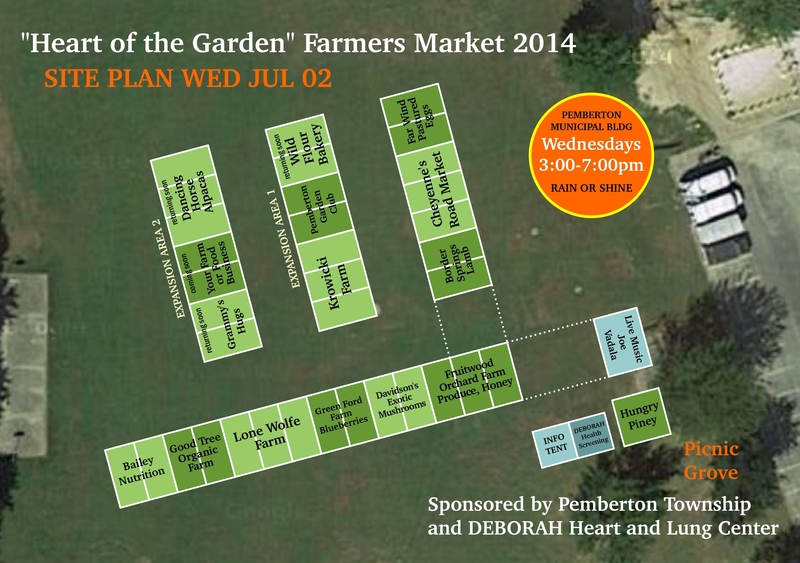 Today, WED JUL 16, marks the 7th week of the season for the “Heart of the Garden” Farmers’ Market, co-sponsored by the Township of Pemberton and the DEBORAH Heart and Lung Center. 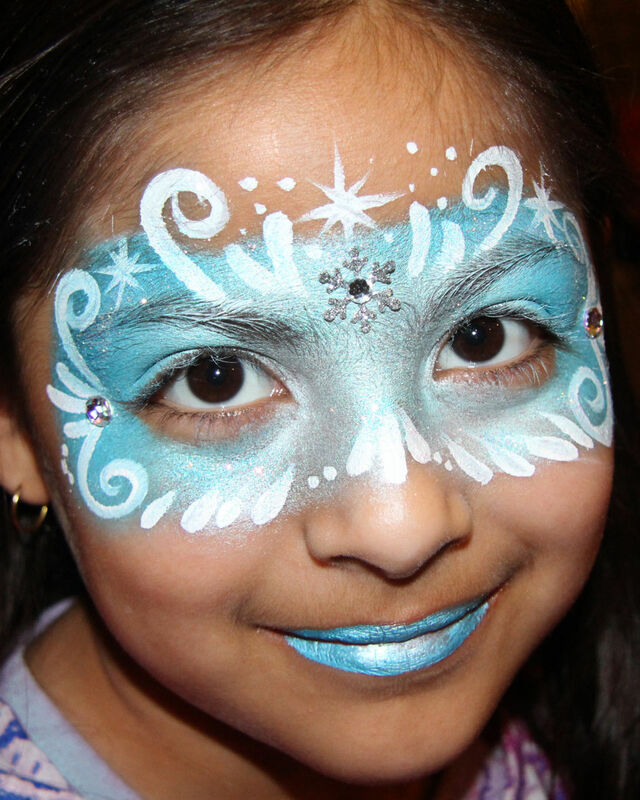 It’s also the first week of our special series of Family Friendly events. 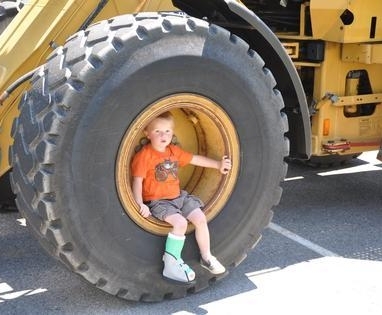 This week’s event: the always popular Touch-a-Truck! Border Springs Farm returns with lamb. Krowicki Farm makes a long-awaited return. Joe Vadala is back onstage with his guitar and his hits. Rita’s Water Ice truck will return for a second week. We’ve been blowing up. We’ve added another 100 likes (now totaling 289). 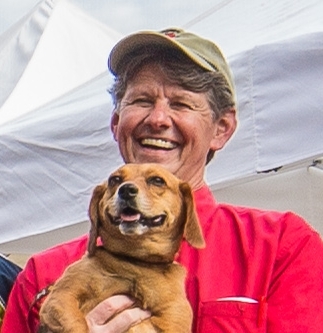 Market Director David Hodges, always in a red shirt and Market cap, not always with his beagle/dachshund Shelby. 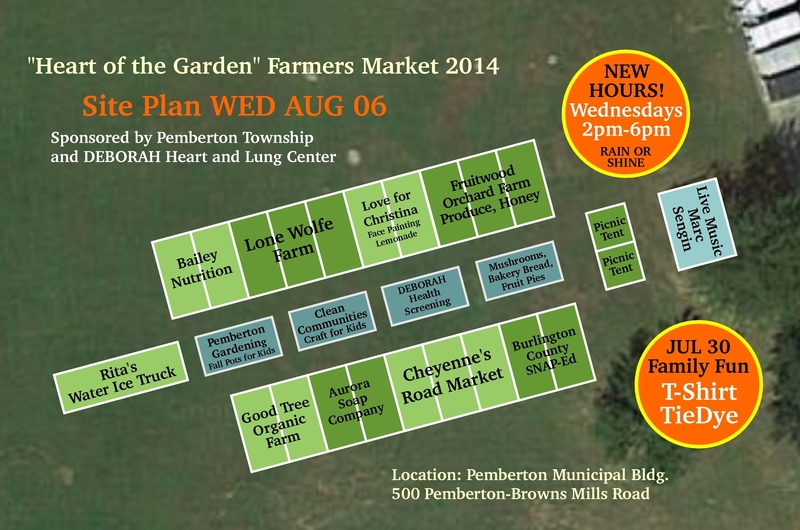 Today, WED JUL 09, marks the 6th week of the season for the “Heart of the Garden” Farmers’ Market, co-sponsored by the Township of Pemberton and the DEBORAH Heart and Lung Center. We’re sorry to have lost the Hungry Piney, but hopeful about the participation of Rita’s Water Ice of Bordentown next week (possibly as early as this week). Davidson’s Mushrooms return after a week off. Wild Flour Bakery will be back after missing a week. Green Ford Farm will be back with early-season blueberries. Cheyenne’s Farm Market will return too. Marc Sengin is back onstage with his guitar and his hits. Come sing along! Arrive at 1:30 if you need the time, but no later than 2:00pm, please. 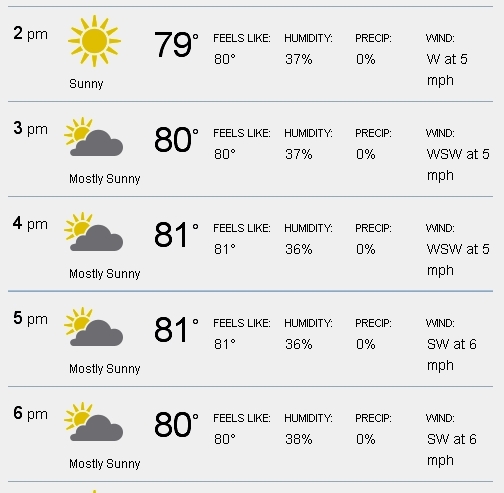 Be set up and ready to sell when the Market opens at 3:00pm. Stay until the Market closes at 7:00pm. 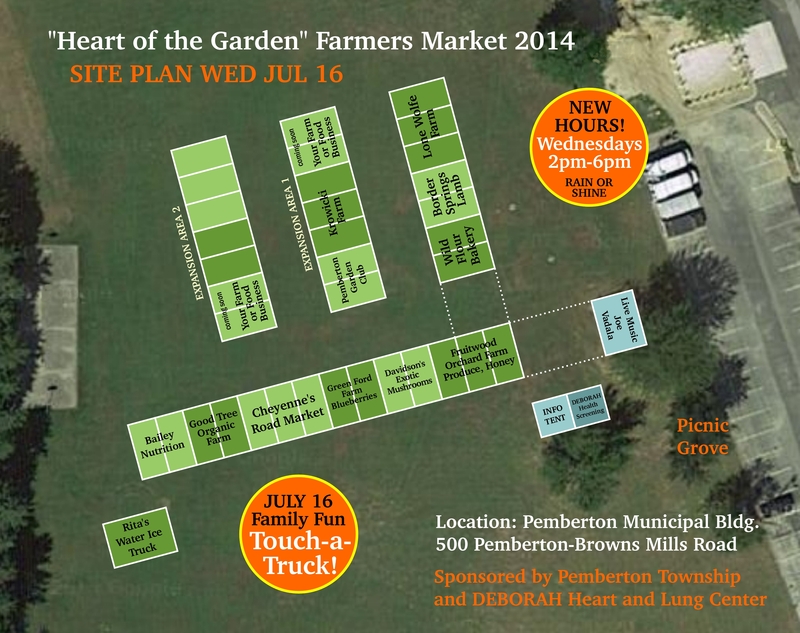 Today, WED JUL 02, marks the 5th week of the season for the “Heart of the Garden” Farmers’ Market, co-sponsored by the Township of Pemberton and the DEBORAH Heart and Lung Center. We’ve added another very local farm this week: Good Tree Farm of New Egypt. Border Springs Farm will also return with frozen lamb cuts and sausage. For the first time, we’re delighted to welcome organic produce from Good Tree Farm of New Egypt. Joe Vadala is back onstage with his guitar and popular hits. Come sing along! Popular favorite produce vendors are also in attendance: Fruitwood Farm Orchard, Cheyenne’s Farm Market, and Lone Wolfe Farm. We’ve been blowing up. 179 Likes in our first two weeks. 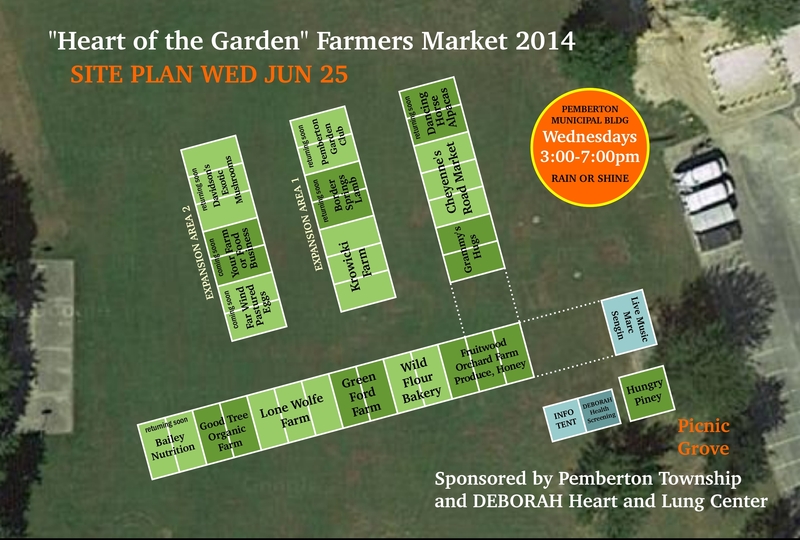 Today, WED JUN 25, marks the 4th week of the season for the “Heart of the Garden” Farmers’ Market, co-sponsored by the Township of Pemberton and the DEBORAH Heart and Lung Center. We’ve added a new feature, prepared refreshments from Pemberton’s own Hungry Piney. We’ll be a smaller Market this week since both Davidson’s Mushrooms and the Pemberton Garden Club are unable to attend. 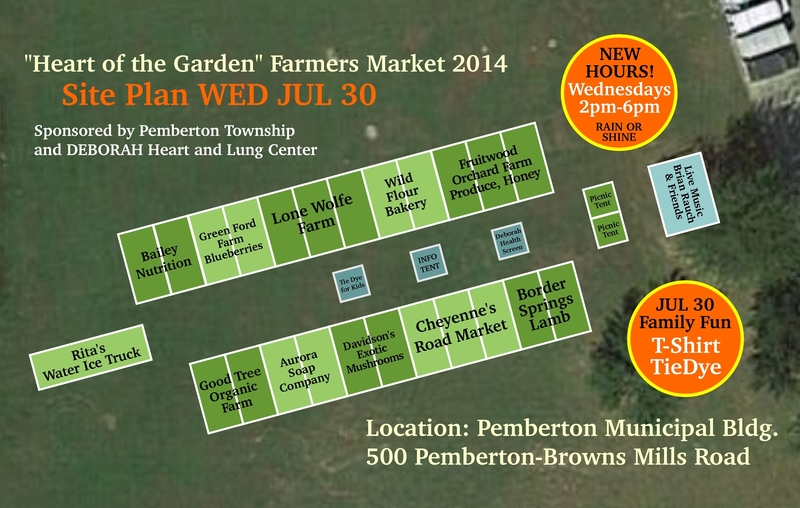 However, we’re adding a new Pemberton vendor, Green Ford Farm, who will bring their early-season blueberries. We’re also hoping that the long wait is over to welcome our first organic produce from Good Tree Farm of New Egypt. Today, WED JUN 18, marks the 3rd week of the season for the “Heart of the Garden” Farmers’ Market, co-sponsored by the Township of Pemberton and the DEBORAH Heart and Lung Center. We’ve added a new feature, prepared refreshments from Pemberton’s own Hungry Piney. Hungry Piney. You’ve been asking for on-site refreshments. Today Hungry Piney will set up at the Picnic Grove to make sandwiches with meatballs and sausage-and-peppers. They’ll also have plenty of cold beverages. 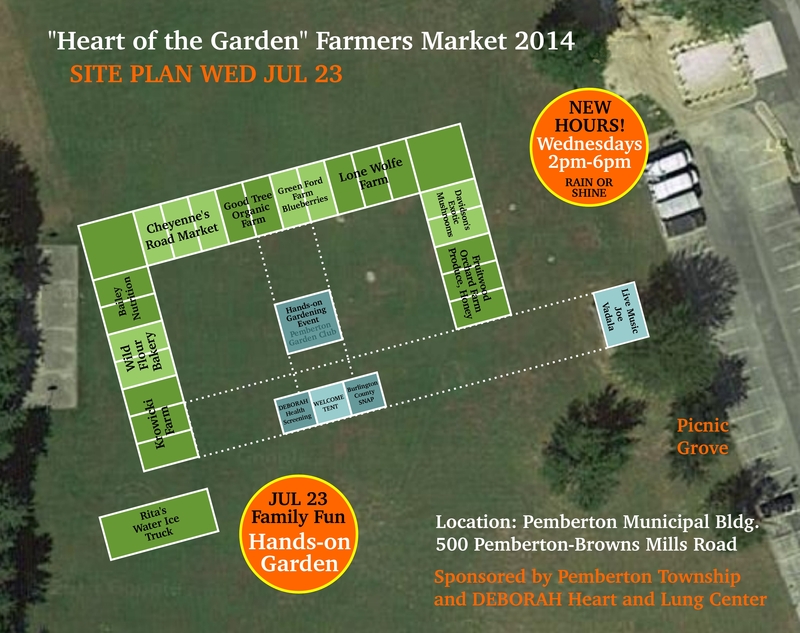 Tomorrow, WED JUN 04, is the Grand Opening of the “Heart of the Garden” Farmers’ Market, co-sponsored by the Township of Pemberton and the DEBORAH Heart and Lung Center. Bring and use tent weights for everybody’s safety. We’ve been blowing up. 52 Likes since we launched the page this morning.